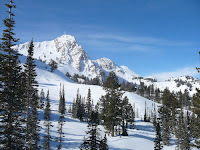 Last weekend was Utah ski weekend, and it was good. 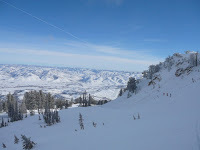 Saturday, I joined a group (which included Ted and Marcus, the Aussie Alpine Express) at Snowbasin for a classic bluebird day and we had it all: groomers, tree runs, hikes to double-diamond drop-ins at 10,000 ft, etc. 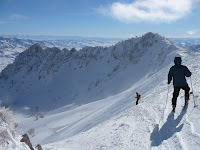 Great fun; it constantly amazes me how much good skiing is within one hour of SLC. 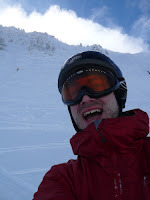 The next day was with most of the work crew at Snowbird. Soon, we had formed a ratpack of enablers whose sole purpose was to seek and destroy tree runs, steeps, and powder stashes. I felt good about this day...no photos from me, but one may exist over on Planet Kaj.